Easter is just around the corner and it’s always so much fun to bake during this time. The pastel colors, Easter eggs, and bunnies make baking a time to create with the family. 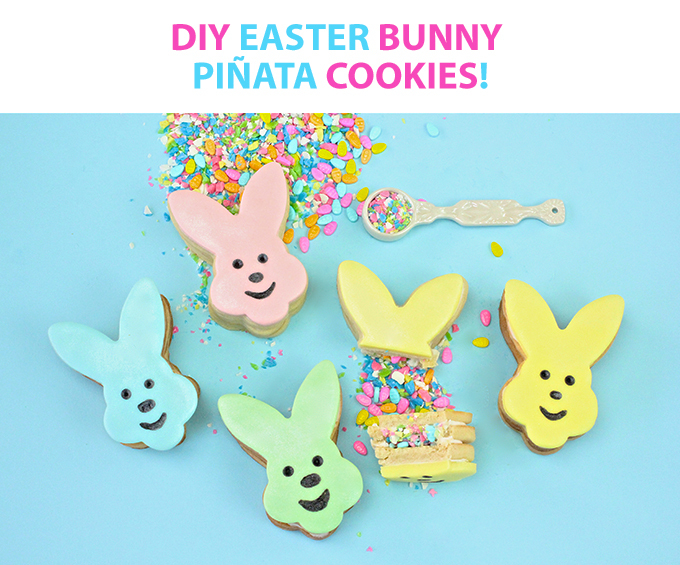 If you’re still looking for some special tasty treats to make for this Spring time holiday, you’ll definitely want to check out these cute and easy to make DIY Easter Bunny Piñata Cookies. They are layered cookies filled with a sprinkle surprise inside. Hi everyone! I’m Vanessa Diaz of Brite & Bubbly and here’s how to make this festive and simple Easter treat! 1. First you make your sugar cookie dough per your mix or recipes instructions. You then divide dough into two round discs and wrap them in plastic wrap. You then place them in the refrigerator to cool and harden up for an hour. 2. Once your sugar cookie dough is cooled and hardened up a bit, you take out one of the discs to roll out. You want to do one disc at a time in order for the dough to not become too soft. 3. You then roll the dough directly on your cookie pan. You place some parchment paper on your cookie pan, sprinkle some all-purpose flour on the parchment paper, and then roll out the dough until it’s about a half an inch thick. 4. You proceed to cut out your bunny cookies and bake them according to your recipe specifications. It’s usually for 7-11 minutes. Each disc makes six cookies to bake on each cookie pan. 5. Once you’re cookies are done, as soon as they get out of the oven, you take your one inch round cookie cutter and cut a circle out of two of the bunny cookies. This is the cookie you will put the sprinkle surprise into and use as the middle layer. Let your cookies cool completely and harden up. 6. Once your cookies are hardened and cooled, you then proceed to make your piñata cookies. 7. First you place one cookie at the bottom and ice it with some of the Wilton Ready-To-Use Decorator Icing. You then place the cookie with the circle hole in it on top of it. You fill the circle hole with a variety of sprinkles and then place some more icing along the edges of the middle layer cookie. You then place a cookie on top of this middle layer to contain the sprinkles inside the cookie. Each piñata cookie uses three cookies to create it. 8. Once you’ve assembled your piñata cookies, you move on to the decorating of your cookies with the pastel fondant. 9. First you roll out one color fondant at a time. You don’t want to fondant to harden, so do not remove the fondant from the package until you’re ready to roll it. Roll each color and use your bunny cookie cutter to cut the bunny shape from each color of fondant. 10. Once you’re bunny shape is cut from each color fondant, you take your black Wilton Decorating Pen and draw on some eyes, noses, and mouths on to the fondant bunnies. Let the faces dry for 5 minutes. 11. Once your faces are drawn and dry, brush with the Wilton Shimmer Dust to give the fondant bunnies a beautiful glittery shine. 12. Lastly, place a thin layer of the Wilton Ready-To-Use Decorator Icing on the top layer of the piñata cookies. This is what will stick your fondant bunny to your piñata cookie. 13. Place your fondant bunnies on to your iced piñata cookies and press gently down to secure the fondant bunnies to the cookies. Repeat for as many piñata cookies as you make. That’s it! You’re done! When you bite or slice the cookie open, a bunch of fun Easter sprinkles will pour out like a piñata. It’s such a fun and creative cookie to eat for Easter. I’m sure who ever you serve these cookies to, they will love them as much as my family and I do! Be sure to shop the bakery section of your favorite JOANN Fabric and Craft Store to make your own Easter Bunny Piñata Cookies!